Your cornflakes taste strange this morning? Someone must have really peed all over them! 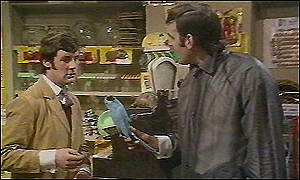 Your comments are turning rather iffy,parrots are ok, fat people and scousers yeah ok fair game. Harry Farr? You should hang your head for that item, unless of course you are speaking from personal experience. Now you prat,what the hell is the offence at wearing a hat?Maybe you enjoy getting your head wet, from this display you'll not harm your brains which must be located someplace lower in your anatomy. Get real Bazza, keep some credability, tarring all the older generation with the same brush doesn't work. Yes, I'm a wrinkly (not a crumbly)and yes, I can drive - not that I have to boast about my qualifications for doing so to you. I guess Fernando Alonzo might object about the wearing a hat behind the wheel deal! I was only thinking this morning that age is a terrible thing. All those parts which functioned so well in my youth are slowly shrinking, becoming less active, or even atrophied. Fortunately, my sense of humour is still as good as it was, my tolerance levels are only slightly diminished, and my head hasn't shrunk so far that my hat falls over my eyes, blinding me to obvious truths. I'm with Bazza on the soldier. For goodness sake. It's been the best part of a100 years. The bloke's daughter could only have been a few months old when her dad was shot. No one remembers the first world war. I doubth that people stand in the street pointing at the old woman and saying: "You see her over there? She's the one whose father was shot a hundred years ago for being a terrible coward." I think the woman's daughter is in on this. She's hoping for that big compo cheque. And if I'm not mistaken, I can smell te presence of an ambulance chasing lawyer on legal aid. Why shouldn't old people get some stick now and then? They're the ones driving the wrong way down the motorway in a Honda Civic, or forgetting which is the accelerator and which is the brake in Sainsburys car park. And I like hats. I have several. Is this a domestic tiff or can anyone join in? "A 71-year-old man gave his wife the shock of her life when he crashed their car into the front room. "It sounded like a bomb going off," said Sandra Nairn, who was in the kitchen of the couple's home in Formby, Merseyside, when the crash happened. Charles Nairn had been reversing the automatic car down the drive when he lost control and then sped forward. Mr Nairn, who is now waiting to find our the cost of the damage, was left uninjured but shocked by the smash." It can't be long before you have to transfer from your Rover into one of those electrically powered trikes that old folk wearing slippers like to nip down the shops with. Still, at least you can drive those will pissed out of your mind... Apparently it's legal. Pass another Buckfast and Vimto, will you? I with you on this one Bazza - oxygen thieves should have their licences revoked when they hit 65 (or the car in front). The old coffin dodgers really are a menace especially on a Sunday when they seem to come out in droves. oh my goodness it worked... sorry about that!!!! laughing... ok..my comment was... 'très amusant.. imagine the fatty chaos with people jammed in the guages at easyjet.. more queues' !!! Barry, most of the time I'm in agreement with you, but belittling Harry Farr like that - my great-grandfather fought in the Great War, and suffered continual nightmares because of it. I bet you watched "Paths of Glory" with a smile on your face, thinking good enough for the cowardly froggies. If I may add a comment as someone who has spent a little time looking at military history: All the men shot for desertion/cowardice during WWI were repeat offenders. In other words, they had deserted/shown cowardice, been caught and punished in a more lenient manner at least once before. Now justice was pretty rough 100 years ago not least in an army struggling to cope with the effects of a type of war for which it was totally unprepared. But a lot of things used to be done more harshely in days gone by. Are we going to apologise for everything that we now perceive as "unjust"? Harry Farr was a victim of the times in which he lived, but millions of other soldiers lived through the same times without running away. What do we do to their memory if we pardon someone most of them would have despised?